I’ve worked as an event planner since the early 1990’s, producing fundraising, corporate and social events, but the technical production side has always been a mystery to me. 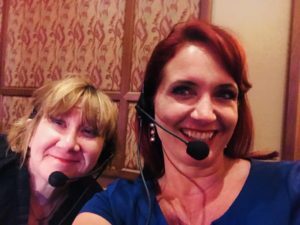 When venues asked me about my a/v requirements, I never quite knew what I needed, and I definitely had no idea what those wizards in black in the tech booth were up to! Since I’m always up to learn new things, I was thrilled when Heidi said I could listen in on comm at an awards dinner Technisch was producing with their partner, Zoom.7. I got there early to meet all the players so I could put a face with a voice at showtime. 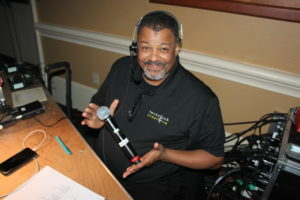 Keith was manning the audio backstage and showed me the Voice of God mic that the announcer uses to let everyone know what’s coming next. He had all the lavalier mics lined up and numbered so he’d be ready to get people mic’d up at the right time before they hit the stage. 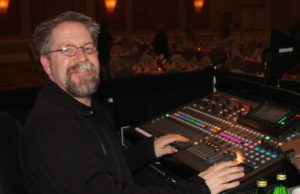 Jim was in his usual position at the main sound board, playing peppy tunes to get everyone pumped up while the team put finishing touches on the setup. 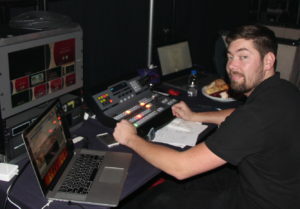 He explained how he mixes in the microphone audio with music to keep the show flowing. Under the direction of producer, Scott Thompson of Zoom.7, the team got to know the players pretty well, and matched music to fit their personalities. Nancy Hart from Zoom.7 was calling the show on this night, which means she’s the big boss. All of the tech crew have headsets on, and she leads them through the show using a run of show document, which details every moment of the plan. This role takes lots of precision and calm, and intimate knowledge of each part of the process. I watched as the team set up lights, cameras, microphones, and the row of sparkling trophies for the awards. Once everything in the room was in perfect order, Jim cued up the party music and the hotel team drew back the curtains to welcome the excited crowd, all decked in their finest and ready to celebrate. 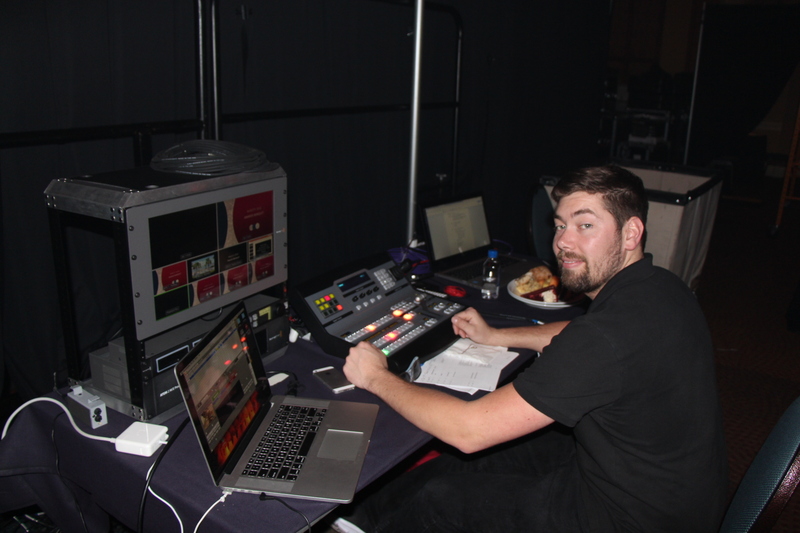 For the first hour, the tech crew’s job was just to keep the music playing and watch the progress of dinner, to determine if the timing would coincide with the awards ceremony plan. 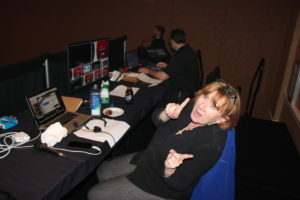 Nancy kept everyone apprised of the plan over comm, so the team was ready to go when the show began! Nancy smoothly orchestrated each element of the awards. Even a relatively simple show like this required so many little details and instructions, and everyone had to be on point. Nancy told Keith when to have the announcer begin speaking, when to mic people up, and when to send people out onto the stage. The video team got their cues to keep the slides moving, and they had to stay on the ball to make sure the right names came up on the screen for each award. Jim and Nancy worked together like a well-oiled machine, having rehearsed the show several times. Jim kept the music going, switching it up when he felt the room needed a bit more energy, and fading it out when people were talking. My biggest takeaway from my first time on comm was how many details, technical elements and instructions go into what seems like a simple awards show. It was so evident that this team enjoyed working together, and the conversation on comm was friendly, fun and professional, but always focused on getting the job done right. Usually at an awards show, I’m only thinking about what people are wearing and who wins what award, and only give thought to the tech team when something goes wrong. Now that I know more about the extraordinarily complex dance that goes on behind the scenes, I’ll never watch the Gala Awards in the same way again! 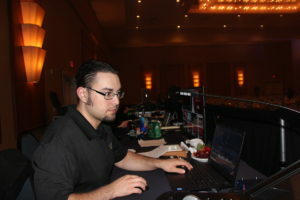 Posted in Getting Technical with Event A/V, Slide, Technisch Creative Behind the Scenes and tagged A/V for conventions, a/v for events, A/V for meetings, conference audiovisual, conference video, event audio visual, Event management, event production, Professional event production, Technisch Creative.